In the Gophers' bowl game last year, Philip Nelson threw for 138 yards and a pair of touchdowns in the 34-31 loss to Texas Tech. For the second time in as many years, the University of Minnesota football team is playing in Houston for its bowl game. 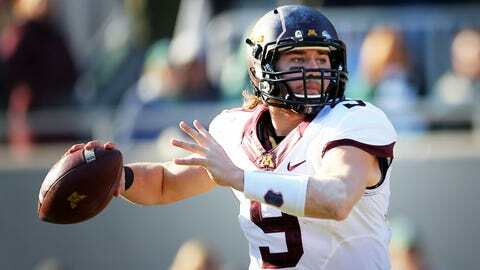 The Gophers will take on six-win Syracuse in the Texas Bowl on Friday at Reliant Stadium. Minnesota finished the regular season 8-4, while the Orange snuck in to a bowl game thanks to a last-minute win in its final game of the year. Here are five things to watch for in Friday’s Texas Bowl matchup. 1. Can the bowl game once again be a springboard for quarterback Philip Nelson? As a true freshman last year, Nelson had his ups and downs as Minnesota’s starting quarterback for the second half of the season. Yet after three disappointing games to round out the regular season, Nelson bounced back in the Gophers’ bowl game against Texas Tech. He threw for 138 yards and a pair of touchdowns in the 34-31 loss to the Red Raiders. The 2013 regular season ended similarly for Nelson, as he struggled in losses to Wisconsin and Michigan State. Syracuse has allowed 230.3 passing yards per game, but some opponents put up significantly more yardage than that. Clemson put up 468 yards and five touchdowns through the air, while Northwestern was able to pile up 375 passing yards and four touchdowns earlier in the year. Nelson showed in wins against Indiana and Penn State that he’s capable of moving the ball through the air, and he’ll have a chance to do so on a big stage against Syracuse. He’ll need some help from his freshmen wide receivers, Donovahn Jones and Drew Wolitarsky, in order to do so. 2. How will the Gophers embrace the role of favorites? According to the oddsmakers in Las Vegas, Minnesota is favored by 4.5 points for Friday’s game against Syracuse. It’s the sixth time this year the Gophers are favorites, but just the second time since the start of the Big Ten season. In its last two games, Minnesota was the heavy underdog against Wisconsin (16.5 points) and Michigan State (17 points) and beat the spread in both games despite losing both. During the Gophers’ four-game winning streak against Northwestern, Nebraska, Indiana and Penn State, Minnesota was the underdog in three of those games — twice by double-digits. While the Gophers seemed to embrace that underdog mentality, they’ll now be the ones with the targets on their backs against Syracuse. "It’ll be different, but at the same time it’s not something we pay attention to," senior defensive back Brock Vereen said of being favored. "If anything, it’ll just raise confidence a little bit." Once the Gophers’ third-string running back, Cobb emerged midway through the season as the go-to back. He became the first Minnesota back since 2006 to rush for 1,000 yards in a season, finishing the year with 1,111 yards and seven rushing touchdowns. He also gained 100 yards in five of the Gophers’ final six games this season, including 101 yards against a stingy Michigan State defense in the regular-season finale. He’ll now try to do the same against a Syracuse defense that has yet to allow a player to gain 100 yards in a game. Even though Georgia Tech rushed for a combined 394 yards, no individual topped the century mark. The Orange surrendered 138.3 rushing yards per game this season, the 26th-fewest in all of college football. Then again, Michigan State had the top-ranked run defense in the country and Cobb still gashed the Spartans. If he can do the same thing against another solid run defense on Friday, Minnesota’s offense should find success. This year’s Gophers roster consists of 18 seniors, and 10 of those are fifth-year seniors. This group has gone through a lot during their four (or five) years on campus, including a coaching change, the death of a former teammate, and the health issues that current head coach Jerry Kill has dealt with since his first season in 2011. While not all of the 18 seniors will see the field on Friday, a good number of them could likely play a big part in what happens against Syracuse. That includes senior defensive tackle Ra’Shede Hageman, who will likely be a first-round pick in the NFL Draft in May. Offensive lineman Ed Olson will get his last chance to part of a much-improved Gophers offensive line. Linebackers Aaron Hill and James Manuel will be part of the group trying to slow down Syracuse’s potent running game. And on special teams, long snapper Jake Filkins and kicker Chris Hawthorne will do their part in the less glamorous areas of the game. For a group of seniors that has endured as much as this one, ending their careers at Minnesota as bowl winners would be a fitting way to go out. Minnesota’s football team hasn’t won nine games since 2003, when it went 10-3. Prior to that, the last season of nine or more wins was back in …1905. The Gophers have just seven nine-win seasons in the program’s history, dating back to 1892. Of course, during some of those seasons they only played eight total games, so nine wins was impossible. Regardless, winning nine games would be huge for this program as it continues to rebuild. Just two years ago during Kill’s first season, Minnesota won just three games. To make an improvement of six wins in a span of two years speaks volumes to the job that Kill and his staff have done in a short time. While the Gophers were disappointed with ending the regular season on a pair of losses, they could certainly hang their hats on a nine-win season — something that doesn’t happen often in Minnesota. There’s a chance it could happen on Friday.